Paint Outs Archives - Art Matters! UVAA’s Umpqua Plein Air is a three-day annual painting event and competition for artists working en plein air. During the event, artists will capture Douglas County’s wild and stunning landscapes including the breathtaking, emerald waters of the North Umpqua River and the peaceful, golden hills at Doc Bailey’s Farm. A Invitation from Silvia Trujillo to Paint en Plein Air! Also coming up is a plein air workshop hosted by The Lassen Art Center in Shingletown, CA. This location is at the base of Lassen National Park which is a great place to visit during the Fall season for sight seeing, hiking, and just relaxing.The date is set for Oct 21 &22, and if weather permits painting will be conducted outdoors to capture the Fall scenery. In case of rain we can paint indoors while looking out at the lovely grounds of the center. I know for many of you in the Rogue Valley it’s been one long, smoky summer. Personally I was unable to get out to paint on location as much as I would’ve liked so now that the smoke has cleared I’m planning on making up for lost opportunities. Please feel free to contact me if you would like to join either of these workshops or would like to set up a private session or two. On the front lawn at Art Presence Art Center in Jacksonville, Oregon! The Artists Workshop is holding their 2017 Plein Air Event this year from June 28-July 1, 2017. 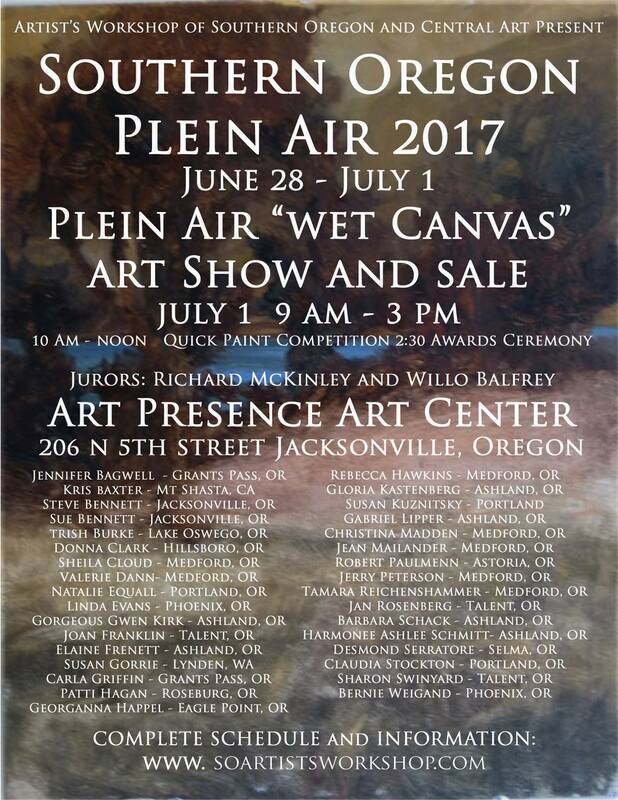 Participating artists will paint on location for three days, then present their work for judging, a show and sale on the front lawn of the Art Presence Art Center in Jacksonville, Oregon on July 1 from 9 am – 3 pm. There will be an exciting quick-paint competition from 10 am to noon, and the awards ceremony takes place at 2:30 pm. Over 30 artists are participating in this year’s event, which means there will be a wide range of plein air painting styles available to interested collectors. Jurors are Willo Balfrey and Richard McKinley, so you know the awards will be decided by two of the most highly respected artists in the Valley! The event takes place side by side with the July reception for the new art exhibit at Art Presence Art Center, so be sure to come inside and view the paintings and other art works in the gallery too! Last day for Early Registration is Monday, May 15th! Over $1500 in Cash Awards & Prizes! Visit www.soartistsworkshop.com or call 541-324-7624 for full details and schedule! Click the image to visit the Artists Workshop website for more information about the Great Southern Oregon Paint Out and to sign up! 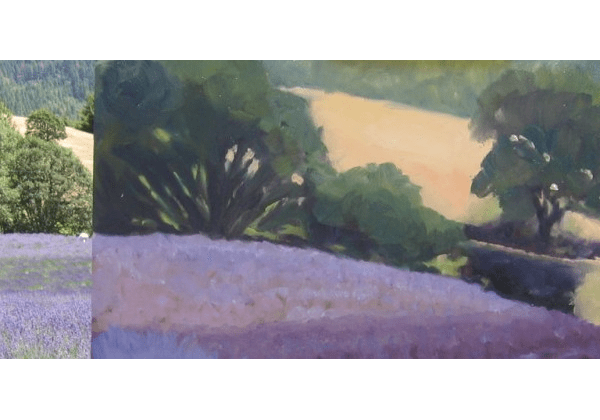 McCloud ARTS Society, in partnership with McCloud Local First, is again hosting “Paint the Town” ‘en Plein air’ artist’s experience, on Saturday August 15, 10 am to 6 pm in McCloud, CA. Painting outdoors with a group of painters or alone provides the artist, novice or experienced, with a stimulating, ever-changing experience. The changing light patterns, the smell of fresh air, the sounds of the forest or river brings an artist to paint outdoors. There is no confinement, very few interruptions, and concentration begins. The connection to nature is visible on canvas or paper. Plein air painting has grown across the nation in recognition with participation at all levels of artistry. McCloud Arts Society is in its third year of offering an opportunity for artists and students to join them for the day. Locations for subjects have been previewed for good vantage points and compositions; otherwise, an artist can come and select their own location from the McCloud Falls to old garages. At the end of the painting day, 3:30pm, a wet paint art show will be displayed on the porch of the mercantile building for the public to enjoy. It will be an informal exhibit with wonderful music and wine. Music by Allison and Victor will lend support to the day of French style of painting. The public is invited and asked to vote for their favorite piece. The winner will receive $50 and the privilege of having their work on next year’s postcard. Campbell Global has funded our scholarship program that will support participation of up to 10 students under the age of 18. Each student will receive some instruction and supplies. Interested students should contact Chairperson Dorothea Schoenstein at 964-2065. This year on the same Saturday there will be a car show downtown, a quilt show, the melodrama, and our exhibit. More information is available on the McCloud Arts Society Facebook page, or contact Dorothea Schoenstein 964-2065. Pre-Registion is $20 thru August 10, and same day registration $30. A $10 box lunch is available from White Mountain Café, order at morning registration. Canvases and paper for competition must have a registration mark on back. Want to understand pigments, mixing colors and glowing glazes better? This beginning-intermediate to intermediate class will travel through value and color wheel reviews, then move into landscape (hopefully a plein air adventure, weather permitting), greens, design and corrections. Come swim in the wet, juicy world of watercolor, demos, homework and silliness included. Basic watercolor and drawing skills suggested. Your instructor, Elaine Frenett, brings over 20 years of watercolor passion. Her fine art has been collected in museums and her illustrations published from New York to LA. She currently teaches private and group classes and leads annual women’s painting retreats. By Deanna St. Martin, reposted from watercolorsocietyoforegon.com. Watercolor Society of Oregon members can register for the Fall convention from the original post (link at the top of the page) or at the Fall 2014 Convention registration link HERE. Now is the time to plan your visit to the center of Oregon’s new “Wine Country”, October 3, 4 and 5, 2014. Autumn is so lovely in Southern Oregon; summer weather is still here. There is no better place to come and paint. Convention Chair Deanna St. Martin has been busy planning a fabulous weekend full of inspiration and educational opportunities. Downtown Medford will be the center of this convention’s activities; the Rogue Gallery and Art Center and many restaurants and focal points are within easy walking distance from the hotel. Registration begins Friday afternoon at Inn at the Commons, formerly the Red Lion Inn and continues with the Meet & Greet on Friday night, October 3rd. Members will get a chance to meet Juror Linda Baker and catch up with WSO friends, both new and old. Juror Linda Baker has heard so many good things about WSO and can hardly wait to see and paint our lovely vistas. The new Lark’s Restaurant at the Inn at the Commons is a local favorite and a sure place to “perk” up your morning before the convention activities. Saturday Break-Out sessions include many of our local artists presenting classes as well as holding Paint-Outs at the many beautiful locations in the Rogue Valley. Members may choose from many varied events. Jane Hardgrove will help members to get creative with paintings they wonder should be tossed out or salvaged into something else. As a participant you’ll bring in three paintings that you don’t like and turn them into masterpieces. Winnie Givot will hold a Paint-In on creating “Out of the Box Backgrounds.” Winnie utilizes underpaintings as a basis of her fabulous artwork. These will be the inspiration for this break-out session. Kara Pilcher with a panel of fellow artists will hold a critique session on “How to Run a Successful Critique Group.” Artists who participate in critique groups can certainly attest to their value. In addition to the great break-out sessions, Linda Baker will hold two Juror Critiques. These events are often the best attended during the conventions. They provide valuable feedback for the artists who submit painting images as well those who attend the critiques. On Saturday, Paints-Outs will be led by members Norm Rossignol, Steve and Sue Bennett, and Sue Eakin, just to name a few. Lithia Park, the Commons, the Rogue River, and Belle Fiore Estate & Winery are some of the fabulous locations chosen by our Paint-Out leaders. On Saturday afternoon the Artists’ Reception will take place a few blocks from the hotel at the Rogue Gallery and Art Center where the 80 juried paintings will be displayed. Food and beverages will be served, and all who attend will have a chance to vote for the “People’s Choice Award”. Then it’s back to the Inn at the Commons for the Awards and Dinner. Sunday morning events start at 9:00 a.m. with the Members’ Business Meeting (and raffle) followed by a lecture and demo by Linda Baker. Following the convention, WSO is pleased to present a Linda Baker Workshop to be held October 6-10 at the Rogue Gallery. Registration began in May, with a registration form in the May issue of The Watermark.